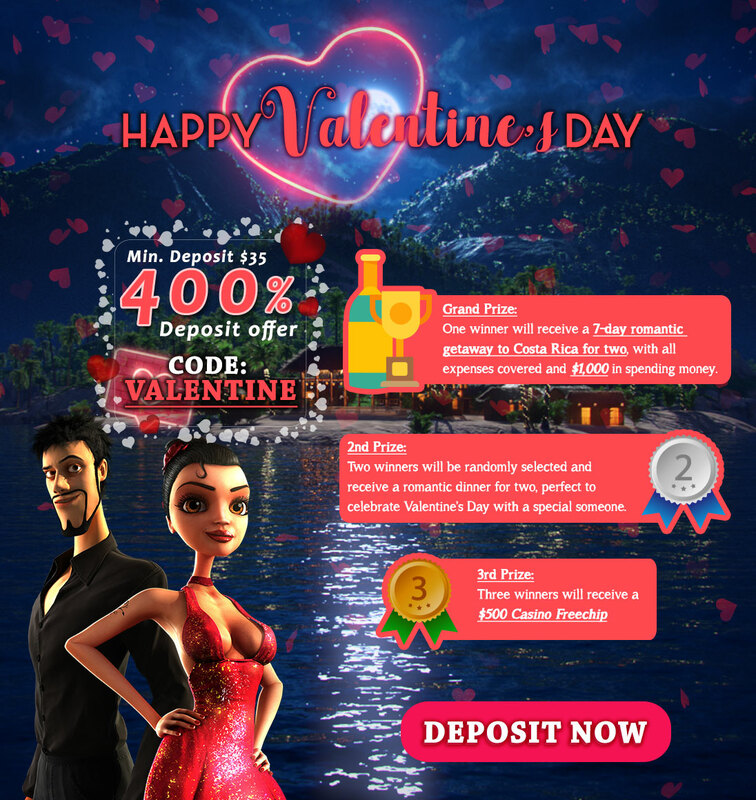 Starting from February 8th until February 14th, deposit 35 USD or more with Code: VALENTINE, then wager at least 20 times. For more raffle tickets, simply deposit more during the weekend as there is no limit to how many tickets each player can have. One winner will receive a 7-day romantic getaway to Costa Rica for two, with all expenses covered and $1,000 in spending money. Two winners will be randomly selected and receive a romantic dinner for two, perfect to celebrate Valentine's Day with a special someone. Feel free to contact our customer support +1-888-479-6636. The Easter Bunny has finally arrived with its basket full of special Easter bonuses and surprise gifts. Grab it before they are gone! The Easter Bunny won't mind nor will the casino host. Fill your bag with Free Chip and enjoy in the latest slot games and win BIG!. Get our 400% Deposit Bonus using below codes. Deposit 35 USD or more with any one of code Egg400, then wager at least 20 times. You will get an opportunity to enter the Easter Egg Hunt Challenge. For more raffle tickets, simply deposit more during the weekend as there is no limit to how many tickets each player can have. Winners will be picked with the highest numbers of tickets. Winners will receive Surprise gifts.